The Augsburg students were initially attracted to the program for many reasons. Carlson was interested because she could study in both her international relations and Spanish and be in a foreign country that wasn’t too far away from home. Soderberg said he was excited about the work experiences. He and fellow Auggie, Kaity Berg, will be working on the business and marketing plans for a local cooperative water park as part of their internship. Aside from the coursework in business and Spanish, educational excursions, and internship placements, CGE’s business program also offers an opportunity for students to immerse themselves in Mexican culture. Berg says her greatest lessons have come from the interaction with Mexican people, especially during her four-day family home-stay in rural Amatlán. The experience made all the students look forward to their month-long home-stays with local families, which will begin in early November. 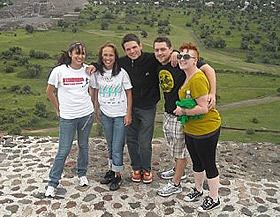 Article by Stephanie Jackson, intern, CGE Mexico.